The Allenhurst Dot Casual Shirt is one of our finest shirts for spring. This white shirt has a subtle, jacquard dot pattern that adds some texture and unique dimension to the shirt. This shirt was constructed with 60% cotton and 40% linen for a lightweight and breathable shirt with a soft handfeel. 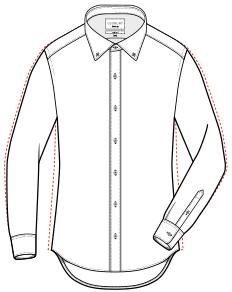 Finished with the Ledbury Button-Down collar and a shortened body length. Available in classic and tailored fit.